George Hunzinger crafted furniture in New York beginning in the late 1800s with one of his earliest patents for an extension table dating to 1860. He patented and manufactured many Renaissance Revival styles during his career. "Although his work belongs in this category ... it stands alone as a category unto itself," according to RareVictorian.com. He is undoubtedly best known for his "lollipop" carving, a disk shape mounted on a spindle, which emulates a child's candy sucker. Many of Hunzinger's rocking chairs were made with his elaborate lollipop carving along the backs and arms. These rockers were made in both platform and traditional styles, and most of them had upholstered backs and seats. He also made non-rocking chair styles and sofas with lollipop carving in varying degrees of fanciness, which are desirable to Victorian furniture collectors as well. These unique chairs are usually marked with a Hunzinger stamp to identify them, sometimes hidden under the edge of the seat cushion. They can range in value from several hundred to several thousand at auction depending on the complexity of the style and the quality of the original finish and upholstery. It is unusual to find a Hunzinger chair with the original upholstery in good to excellent condition. Most of these cloth backs and seat cushions have been redone over time. 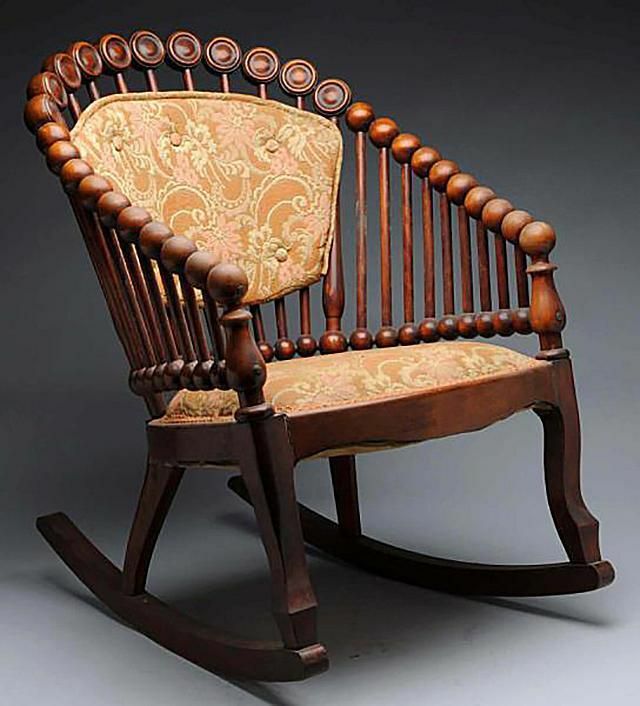 The traditional rocking chair featured above is estimated to bring $400 to $600 at Morphy Auctions decorative arts sale in early November 2012. The rocker is in excellent condition overall, but the upholstery is not believed to be original. While his "Lollipop" rockers may be more recognizable at first glance, George Hunzinger's New York workshop created many patented pieces in the late 1800s. This walnut sofa c. 1870, for example, bears the stamp of Hunzinger indicating that it was patented March 30, 1869. The upholstery has a button tufted back and seat top. Carving includes blocked and turned architectonic crest centered by a classical mask above the back, and female mask terminals on either side of the seat. The bentwood stiles have six "lollipop" carved disks akin to those used in Hunzinger's famed rocking chairs. The piece is also accented with gilt on the wooden elements. The overall styling is very typical of Hunzinger sofas. The pre-auction estimate for this sofa is $4,000 to $6,000. It will sell at Neal Auction Co. in New Orleans, Louisiana on Dec. 3, 2016, and via live webcast auction through Invaluable.com. While George Hunzinger's "Lollipop" pieces may be more instantly recognizable, a chair like this one also has attributes familiar to fans of his work. This chair is stamped with the Hunzinger mark noting it was patented on March 30, 1869 to confirm it's origin. The reclined posture of the chair, padded button back and curved seat, distinctive canted paw feet along with carving featuring swagged crests with gilt medallions are also indicative of Hunzinger's products. Seated furniture by Hunzinger has been conserved in several collections including The National Trust at Lyndhurst (Tarrytown, New York), the Strong Museum in Rochester, New York, and the New York State Museum in Albany. A chair featuring a similar gilt medallion has been conserved by the Brooklyn Museum in New York City. The distinctive ornamented design of this sofa and armchair has been described as resembling machine works by some scholars and is considered the apogee of Hunzinger's oeuvre. As part of a set (matching sofa not shown), this lot is expected to bring $3,000-$5,000 at auction. The sale will be held on Dec. 3, 2016 by Neal Auction Co., in New Orleans, Louisiana. While the furniture that left George Hunzinger's New York workshop has some distinctive characteristics, Victorian furniture enthusiasts don't usually have to guess whether or not a piece was made under his direction. Most of Hunzinger's pieces are indeed marked as shown above. The mark oftentimes includes the patent date, as many of Hunzinger's innovative designs were indeed registered just like those of his contemporary John Henry Belter.